The Clean Air Act of 1970 was the first regulation to significantly change the refinery industry by prohibiting lead additives in gasoline. Later amendments were added that created oxygenated and reformulated gasoline bringing about the “boutique fuel” issue. Each of these fuels are available in 3 grades (regular, mid, and super) and are adjusted for winter/summer and northern/southern driving conditions. [ii] When refineries must switch over from winter grade to summer grade gasoline in the spring, motorists have historically seen gasoline prices rise. Reformulated gasoline was the result of Amendments to the Clean Air Act in 1990 and mandated gasoline that burned more cleanly than conventional gasoline. Areas of the country that did not meet the EPA’s ozone regulations were required to use reformulated gasoline. Reformulated gasoline burns cleaner by reducing smog-forming and toxic pollutants, is less prone to evaporation, and uses an oxygenate to improve combustion. There are currently 15 distinct boutique fuels required in portions of 12 states by federal regulation. But, in addition to the federal standards for reformulated gasoline, State Implementation Plans (SIPs) require low-Reid Pressure conventional gasoline. 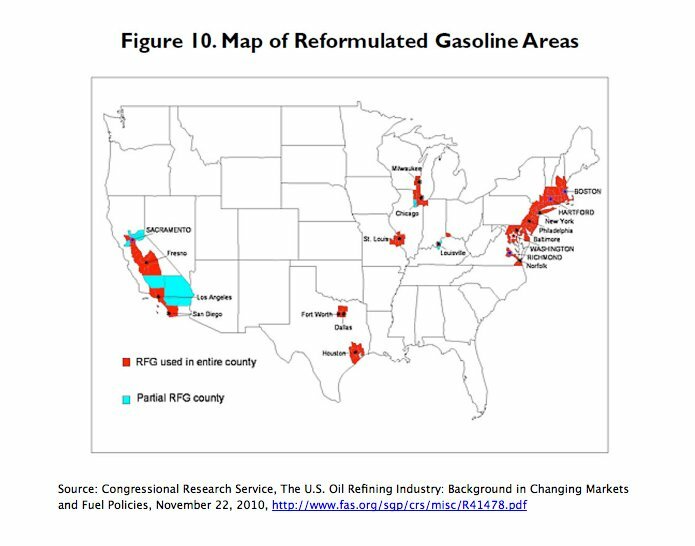 California, whose gasoline prices are higher than the rest of the nation, requires a cleaner fuel than the federal reformulated gasoline and the Midwestern states require an ethanol-blended reformulated gasoline. The Energy Policy Act of 2005 amended the Clean Air Act and limited the number of boutique fuels to those existing as of September 1, 2004. The Boutique Fuel Reduction Act of 2009 further amended the Clean Air Act to provide temporary waivers for unexpected problems that would not allow delivery of the additives and to allow the EPA Administrator to reduce the number of boutique fuels if any became identical with a federally approved fuel or was no longer included in a SIP. Between 1992 and 2005, oxygenated fuel blends were required by EPA to reduce ground-level ozone and smog. At that time, methyl tertiary-butyl ether (MTBE) was used as the oxygenate for states other than the Midwest and ethanol was used as the oxygenate in the Midwest. MTBE and ethanol served as an octane booster, a volume extender in gasoline, and as the oxygenate for reformulated gasoline. Later, MTBE was banned in many states because of ground water concerns, leaving ethanol as the most cost-effective oxygenate. While MTBE could be blended at the refinery, ethanol, because of its corrosive nature, has to be blended at the storage facility where the fuel is dispensed to the fuel truck. The Energy Policy Act of 2005 created the Renewable Fuel Program that mandated the use of renewable fuels in gasoline. That act required the production of 7.5 billion gallons of renewable fuels for 2012. The Energy Independence and Security Act of 2007 increased the target volume to 36 billion gallons by 2022, mandating that 15 billion gallons could be from corn-based ethanol and the remainder had to come from advanced biofuels, namely cellulosic ethanol. 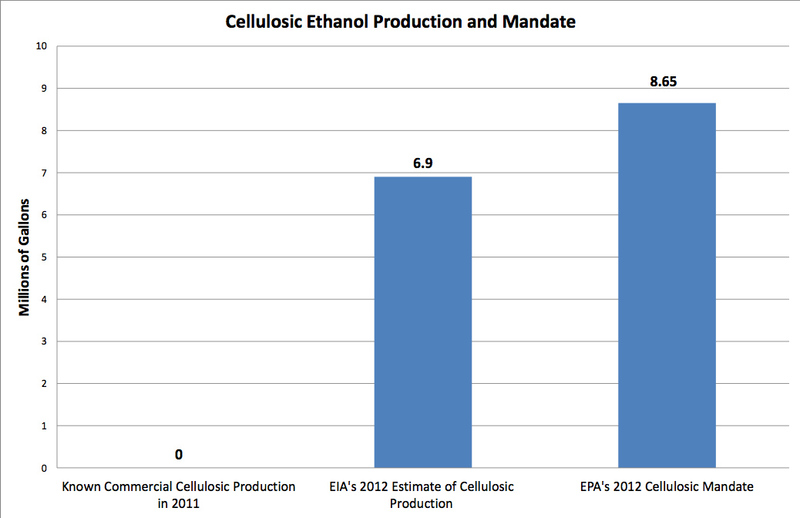 EPA administers the program and can lower the targets for cellulosic ethanol if not commercially available. 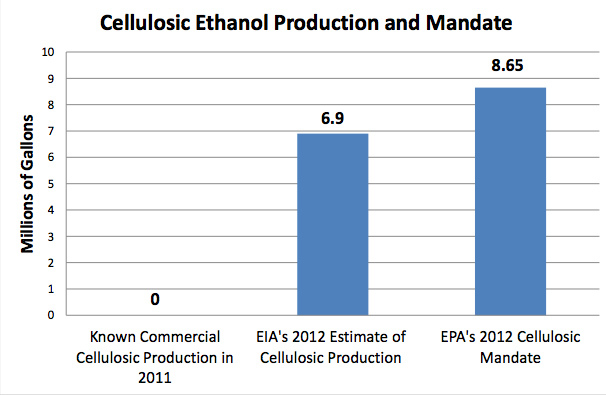 However, the lowered EPA targets are still difficult for refineries to achieve since cellulosic ethanol does not exist commercially. As a result, refiners have had to purchase waivers, needlessly increasing the cost of gasoline. The penalties are estimated to be $6.8 million in 2011 and higher for 2012 since EPA is mandating that 30 percent more of the nonexistent fuel be purchased by refiners. [iii] EPA has also determined that vehicles of model year 2001 or newer can use a blend of 15 percent ethanol and 85 percent gasoline without hurting those engines. Currently, the maximum blend is 10 percent ethanol and 90 percent gasoline. In 2007, the Supreme Court ruled that the EPA had the authority to regulate carbon dioxide emissions under the Clean Air Act. In response to the FY 2008 Consolidated Appropriations Act, EPA required suppliers of fossil fuels, manufacturers of vehicles and engines, and facilities that emit 25,000 metric tons or more of greenhouse gas emissions annually to submit reports to EPA (the Mandatory Reporting of Greenhouse Gases Rule). The rule provides the basis for future legislation or regulation to limit greenhouse emissions from refineries and other industrial users. While a ‘cap and trade’ program to limit greenhouse gases did not pass in Congress as the Obama Administration had wanted, because of the Supreme Court’s ruling allowing the EPA to regulate carbon dioxide emissions, additional regulations are being levied upon industries. Two refineries in Pennsylvania with a joint capacity of 363,000 barrels per day owned by Sunoco and Conoco Phillips were recently idled due to losses resulting from increased regulatory requirements and lower demand for petroleum products. Sunoco estimates that environmental regulatory costs represent about 15 percent of its operating budget. The two idled Pennsylvania refineries along with a third Sunoco refinery still operating in the Philadelphia area employ 1,200 workersand almost as many salaried and contract workers, manufacturing 50 percent of the petroleum fuels produced on the East Coast of the United States. [ix] However, while these refineries are experiencing losses and two are idled, there seems to be some recent interest. According to a March 2011 Department of Energy report, in the past 20 years, federal regulations were a significant factor in the closing of 66 U.S. refineries. (See chart below.) Refinery closures and the recession have led to a loss of over 3,000 direct jobs and 506,000 barrels per day decrease in capacity. The closures and potential closures mark a change taking place in the refinery business, due to the differences in the prices of different crude oil grades from different global producing areas. U.S. east coast refiners pay a higher price for imported crude than other U.S. refiners using Canadian or domestic crude. Other problems affecting the refinery industry are lower demand for gasoline, increasing volumes of ethanol, improvements in vehicle fuel efficiency, permitting delays, and policies to encourage the purchase of electric and other alternate fuel vehicles. Some researchers believe that the United States and other developed nations have reached “peak travel,” and that the number of miles driven per year is not expected to increase as it has in the past. The U.S. refinery industry has spent $128 billion since 1990 to comply with federal environmental regulations[xvii], which adds significantly to the costs of manufacturing refined products. 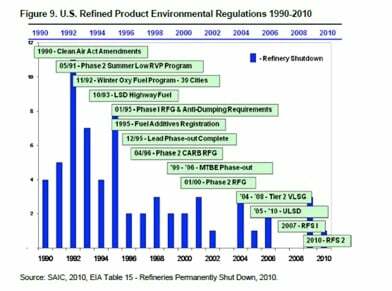 Historically, refiners have supported regulations that were clearly beneficial to the environment. However, as environmental standards are tightened, the cost to meet those standards increases exponentially, threatening the competitiveness of American refineries in the global marketplace. That should be true of all regulations.